Transportation Costs > How Much Does a Teardrop Trailer Cost? How Much Does a Teardrop Trailer Cost? The teardrop trailer was first used back as far as the post-World War II-era when young families wanted a way to take cheap vacations. With a pop-up camper or full-sized camper, as you may know, you will need a larger truck or SUV to pull it to the desired location; however, with a teardrop trailer, it is a pinch larger than a small car, allowing it to be pulled by just about any vehicle. This setup is ideal for those traveling alone or as a couple. The price range of a base model teardrop trailer, on average, can range anywhere from $5,000 to as much as $20,000 brand new. The price of a teardrop trailer will be no different than any other camper — it will all depend on the features, the model, the size and company selling it. The more premium features you add, however, the higher this price can go. For example, TinyCamper.com, has a variety of models that range anywhere from $8,500 to as much as $20,000. Their 500 model, which is five feet wide, for example, retails for $8,500, while their 550 model, which has a styled body, can retail for $9,600 for the base unit. According to this American Teardrop official price sheet, the basic units start at $4,495 for a 3.5×7 Twin to as much as $12,995 for a 6×10 King. These costs won’t include the many options you can add, which, as you can see by following the link, can include quite a few, ranging from $100 to more than $1,000. ColoradoTearDropCamper.com, a teardrop trailer company based in Colorado, offers a variety of models on its website, with prices ranging from $11,300 to $21,500. Most base units will include a kitchen galley below a rear hatch and a storage compartment for your food, a sleeping area that can fit a twin, full or queen bed, aluminum exterior, insulated roof and storage shelves. However, you have the option to add more features, similar to that of a travel trailer or RV. A teardrop trailer can easily be customized to your satisfaction. Premium add-ons with most teardrop trailers can include upgraded skirts, chrome material, additional storage, a couch, lined curtains, roof vent, premium lights and /or additional AC/DC outlets. A teardrop trailer will use hookups at a campsite in the same way that a camper does. Premium features to consider adding may include coolers, a trailer cover, larger fridge, spare tire or a larger water heater. With so many options, refer to our table below to see what these premium options may cost. It’s best to start at $10,000 for a good base model and add the corresponding prices in the table below to offer an idea of what you should budget for if you were to purchase brand new. Delivery charges may apply if the dealer has to deliver it to your driveway. This type of trailer will not have a full bathroom; however, some may have a portable toilet. If you are going to tow with your car, make sure you know how much weight you can safely tow. 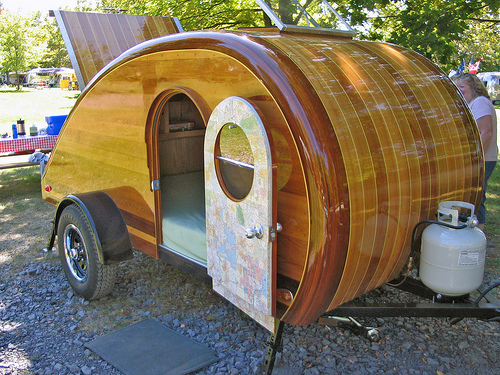 Consider creating your own teardrop trailer. There are many plans on the web that can cost less than $20, and when everything is complete, the DIY option can cost you a few thousand dollars. Purchasing used can easily save you thousands of dollars. Most quality teardrop trailers will cost less than $10,000, but when purchasing used, make sure that you look into how it was built, how well it’s put together and see why they are selling the trailer. On eBay, for instance, we were able to find hundreds of teardrop trailers in great condition for less than $8,000.